I have designed a few collections. On the sub pages are examples of some of them. Here are a few that were featured in VT Wonen Magazine. I love when I have made something that speaks to another person and find that the experience of making something I perceive as beautiful is most important, but when it can transcend that singular experience and communicate with you, that’s when the piece is truly successful. The fact that people choose to live with, use and enjoy my work truly makes me happy. 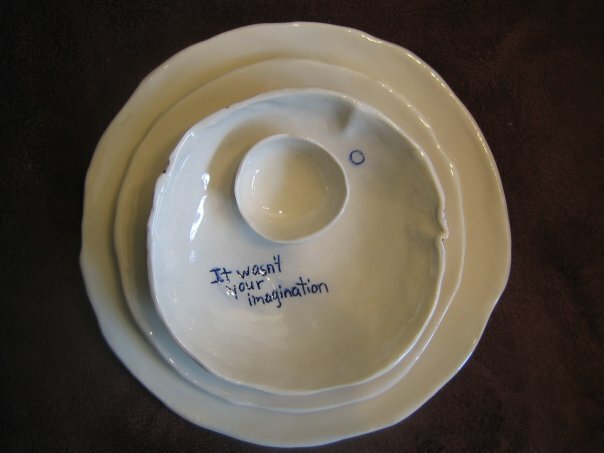 Functional ceramic pieces are created, using handbuilt porcelain as a pliable, 3 dimensional canvas. Inscising, sgrafitto, colored slips and sometimes text are used along with transparent and opaque vibrantly colored glazes. I like that the images and textures are part of the piece, not simply on top of it and that they can be felt with your fingers. I work on the floor, with a rolling pin, a creamy white porcelain and whatever textures I collect while on my daily walks and bike rides through Amsterdam. I feel that this working style and this particular city have a deep influence on my work. The life of the piece becomes complete when it is used. Each piece is fired twice (to 900C, and 1250C) making it durable for everyday use. The fact that people choose to live with, use and enjoy my work truly makes me happy.